Nate Grey returns to save the world in Uncanny X-Men #4, by writers Ed Brisson, Kelly Thompson, and Matthew Rosenberg, artist Pere Perez, colorist Rachel Rosenberg, and letterer Joe Caramagna. This issue lays bare the cause of all the crazy events that have taken place so far while also upping the ante and doing some excellent work with the conflict between the old school X-Men and the younger cadre of X-Men. 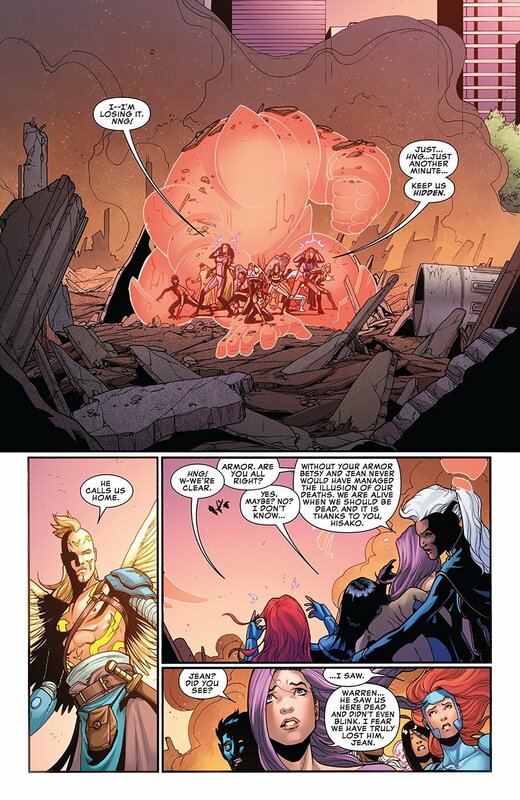 The X-Men trick the Horsemen of Salvation, Magneto, Angel, Blob, and Omega Red, into thinking they’re dead and the Horsemen return to their master, Nate Grey, the Age of Apocalypse version of Cable. He uses his immense telepathic powers to send a message to everyone in the world- he’s going to make the world a better place no matter what anyone says or does. He dispatches his Horsemen to begin his work. The X-Men split up to deal with the Horsemen, but Armor decides to stay and help the her fellow young X-Men clean up the Mansion rather than accompany one of the teams. In his lab, Beast goes to experiment on the mutant “cure” he found in the first issue, but it’s disappeared. One team arrives too late to stop Magneto and Angel and have to deal with the aftermath, while the other interrupts Blob and Omega Red as they’re assaulting an oil drilling platform. Back at the Mansion, the young X-Men talk to Legion, who may be the key to stopping all of this. The key to this book the thing that makes it so enjoyable is how much it feels like an old school X-Men book. Brisson, Thompson, and Rosenberg have a lot of love for X-Men and it shows in every page. The X-Men should always feel like a mix of the Avengers and the Fantastic Four. The Avengers are a team first and foremost, the Fantastic Four is a family before everything else, but the X-Men are both of those things. They work together like a well oiled machine, but they also bicker and fight and love each other. This book is playing with that dynamic with the conflict between the older X-Men and their younger counterparts. In any family, it’s sort of natural to treat the younger siblings as lesser, even if they’ve been through as much craziness as the older ones. It’s also natural for those younger siblings to rebel and want to do things their own way. This conflict is perfectly played out and adds so much to this book. The introduction of Nate Grey as the “villain” of the piece is quite interesting as well. Grey comes from the Age of Apocalypse, a world ruined by a disastrous war between mutants and humans. His entire life was spent in conflict and it has marked him. His desire to save the world at any cost is a noble one, but the book makes a point of saying that one person’s view of a perfect world doesn’t necessarily fit another’s. It will be interesting to see how the X-Men will deal with him. He’s not really evil, per say, he’s just a misguided, damaged man trying to do what he thinks is the right thing. Pere Perez is back on pencils and so far, he’s the best of the pencilling cadre this book has assembled. His art is crisp and clean and his detail and linework are top notch. There’s not any page or panel that stands out as something extraordinary, but that’s okay, because it’s all so well done. Rachel Rosenberg’s colors have a softer focus and they fit his pencils perfectly. Uncanny X-Men #4 lays bare what has been going on the book, without giving away everything. This story can still go to so many places and that’s what makes it interesting. Nate Grey and his quest to make the world a better place at any costs are sort of a perfect conflict for the X-Men to deal with since it’s almost a twisted inverse of their mission. The drama between the different generations of X-Men is great and the art is solid. It will be interesting to see where the book goes from her, but so far, this is the best issue to come out.